You don’t need to freeze to see aurora! The aurora is well-known to the savvy Aurorasaurus observer – fanciful colored lights in the sky caused by charged particles energizing the atmosphere near the North and South poles. But did you know that you can observe aurora as far south as Arizona? Or that the sky still glows at night in the absence of any aurora? For the first time, a new project is capturing these rare events with affordable cameras located in high schools across the United States, also enabling space-science education. The Midlatitude Allsky-imaging Network for GeoSpace Observations (MANGO) captures these atypical observations of upper atmospheric airglows and low-latitude auroras, and applying image processing algorithms to correct distortions and to eliminate background noise. This system will be used to study macroscopic-scale auroras and airglows over the country and to characterize the dynamics of charged particles in the ionosphere. The processed images are then geo-located on a map of the United States for real-time display on the project website for anyone to use- check it out! What are stable auroral red arcs (SAR) and air glow? MANGO is used to study propagating waves in the upper atmosphere, called traveling ionospheric disturbances (TIDs), expansion of auroral oval to lower latitudes and stable auroral red (SAR) arcs, which occur during extreme geomagnetic conditions. 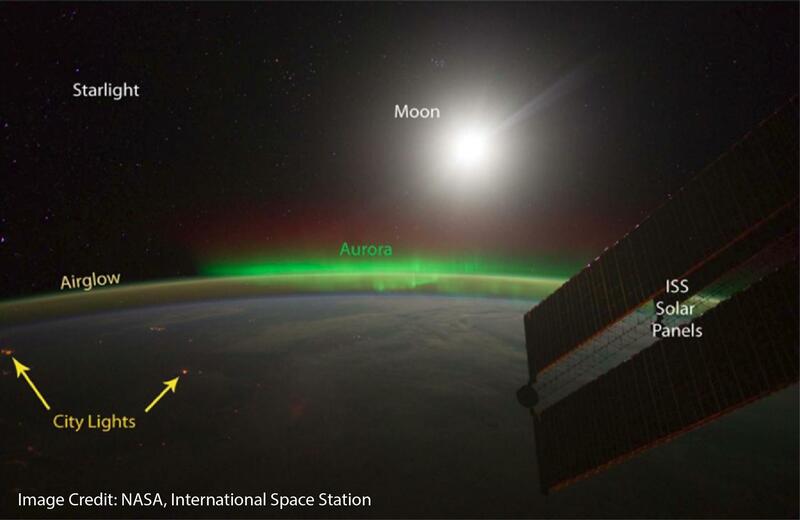 During strong geomagnetic storms, aurora that is typically confined to high-latitudes moves to lower latitudes as Earth’s magnetic field becomes stressed and compressed. Additionally, rarely, during geomagnetic storms, the Van-Allen radiation belt regions move closer to Earth and cause large-scale generally sub-visual displays of red (630 nm) emission at mid-latitudes. These relatively stable displays are known as Stable Aurora Red (SAR) arc and can be observed stretching from Massachusetts to Washington. Air glow originates when the neutral gases (oxygen, nitrogen, sodium) in Earth’s upper atmosphere receive a high dose of ultraviolet energy from the sun during the day. This energy causes electrons and ions in the neutral gas molecules and atoms to separate and the upper atmosphere is flooded with charged and excited particles. These charged and excited particles are constantly recombining to get back to their neutral state. As the particles recombine or return to unexcited states, they may release a photon in the visible wavelength range. The color of this visible light depends on the gas molecule or atom involved. 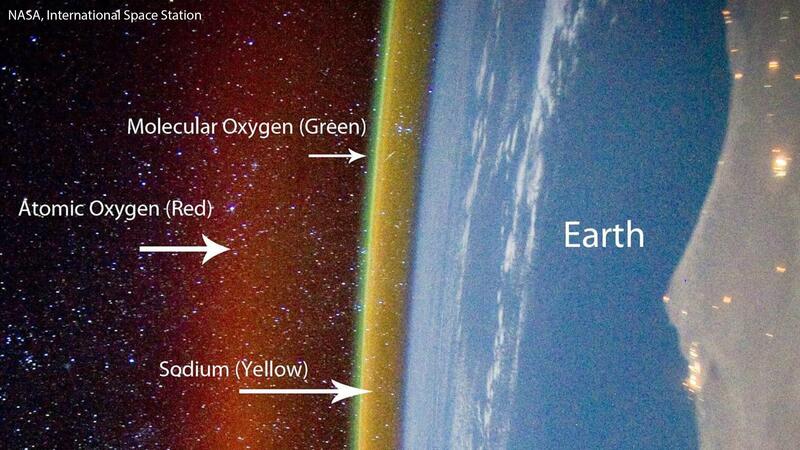 This light is known as airglow and is visible as a blanketing layer around the earth. During the day, scattered light from the sun itself is much brighter than the airglow process and it is very challenging to observe. At night however, when the sun is below the horizon, the sky is dark enough for airglow to be easily detected by cameras with long exposures and good filters. Observing slight variations in the airglow layer gives information about disturbances in the upper atmosphere at night that are poorly documented. How does MANGO capture SAR and airglow? Although these phenomena span continents, optical observations over North America have been conducted only at isolated camera sites, and a global-scale view did not exist. MANGO is a collection of seven cameras spread across the continental United States with the goal of imaging large-scale airglow and aurora features. These cameras form a network providing continuous coverage over the western United States, including California, Oregon, Washington, Utah, Arizona and Texas, and extending south into Mexico. MANGO observes the generation, propagation, and dissipation of medium and large-scale wave activity in the subauroral, mid and low-latitude thermosphere. The project is funded under a National Science Foundation grant at SRI International. An all-sky camera has a maximum field-of-view of 1200-1500 km2 at ionospheric altitudes between 250 and 350 km, making this instrument an excellent ground-based observing tool to monitor large-scale dynamics in the ionosphere. 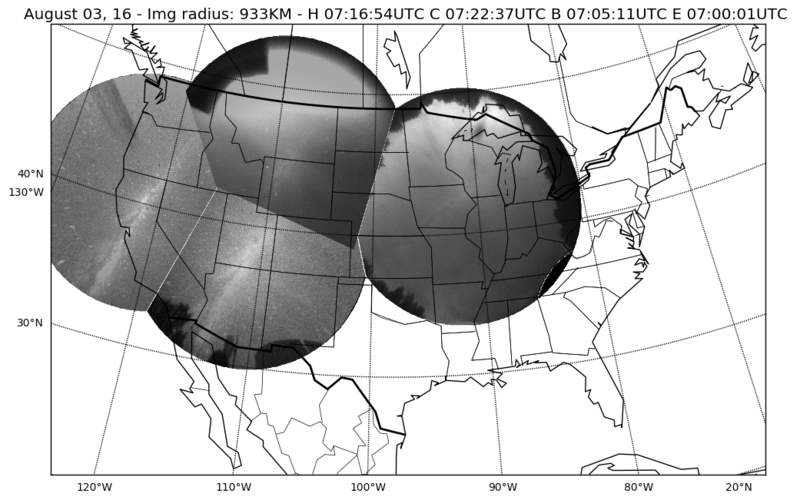 The combined view from multiple cameras can be used to image continent-scale structures and provides an unprecedented coverage of ionospheric airglow dynamics in the continental United States. In the image above, diffuse aurora (or aurora over a large area) can be seen in the cameras in Montana and Iowa, while wave like structure is seen in the California and Utah cameras. Such a mosaic gives us a view of coupling between regions that have different manifestation of same geomagnetic processes. Each camera in the MANGO network has a red filter centered at 630 nm with a view of the entire sky. Designed for low-cost ease of replication, each system is configured entirely from off-the shelf parts with an amateur astronomy-grade camera as the detector. Images are acquired every five minutes and are stitched together to provide a mosaic view of airglow across the entire United States. 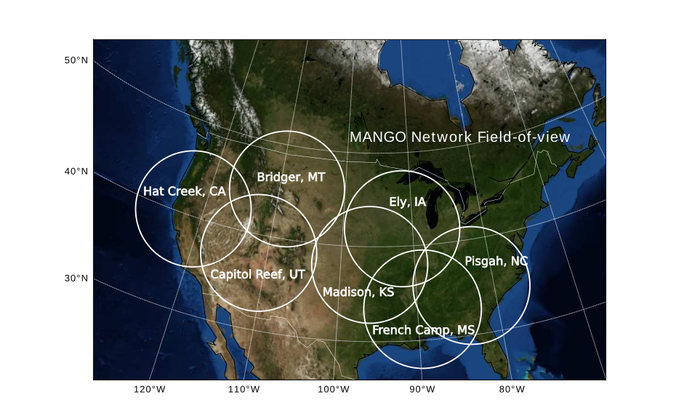 Because nighttime imaging of faint emissions from the sky requires really dark skies, the MANGO team has partnered with several amateur astronomy observatories and schools in rural areas across the United States to install the MANGO cameras. 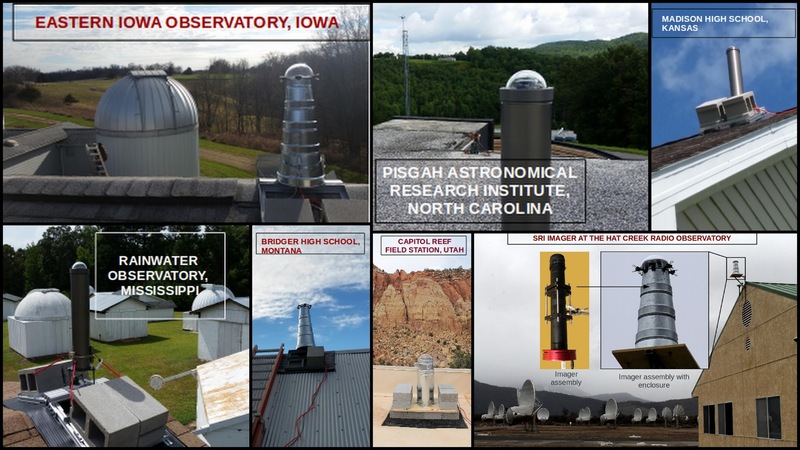 These are high schools in Bridger, Montana and Madison, Kansas and Hat Creek Radio Observatory, California; Capitol Reef Field Station, Utah; Palisades-Dows Observatory, Iowa; Rainwater Observatory, Mississippi; and Pisgah Astronomical Research Institute, North Carolina. The MANGO team visited the high schools and gave a seminar to the science teachers and students on space weather followed by hands-on activities centered around dipole magnets and compass that teach the students the importance of earth’s own magnetic field. Most of the observatory partners are themselves non-profit and amateur astronomy observatories that provide amazing support for scientific researchers. If you’re an Aurorasaurus user, you will want to check out this new real time resource. This entry was posted in Other resources for aurora hunters. Bookmark the permalink.